Join Colorado Cattle Company and Guest Ranch where they welcome all types of cowboys and cowgirls, from the timid beginners to the fearless veterans. They offer multiple levels of riding experiences, so fear not, they will cater to your skill and comfort level. Colorado Cattle Company and Guest Ranch have over 80 extremely well trained and well-mannered quarter horses. Some are quiet for the beginners, others are more highly spirited for the experienced riders. The Colorado Cattle Company and Guest Ranch is a family who takes great pride in the care of their animals and stewardship of their land, they enjoy their lives and wish to share that enjoyment with others by fulfilling their guest’s dreams, so join them for a true Colorado dude ranch vacation! The main lodge is the meeting place for meals, the location of the laundry area, indoor pool, hot tub, gift shop, coffee bar and snack area. Guests sleep in either the deluxe rooms which were the original homestead on the ranch or in one of the charming log cabin duplexes. The deluxe rooms were built in 1897, added onto in 1909 and again in 1921. The deluxe rooms have been refitted and modernized with five private bedrooms designed for couples. Each deluxe room; the Longreen, the Meadow, the Canyon, the Blackrock, and the Farside have a private bathroom, one queen size bed, and a private entrance. Prices for the deluxe rooms are based on double occupancy. Newly constructed standard log cabin rooms are designed for singles and friends traveling together and have two comfortably sized individual beds. The standard cabins also have private bathrooms and entrances. Both the deluxe rooms and standard cabin rooms share excellent views of the meadow where the sunrise greets guests every morning. The porches are favorite gathering spots for early morning coffee or a quiet spot to read a book in the afternoons. The horseshoe pit, roping practice area, hot tub, and swimming pool are located nearby. All deluxe rooms and standard cabin rooms have individual air conditioning and heat control for comfort in all weather. Unlimited hot water soaks away the stiffness and fluffy down filled comforters are snug and cozy. Each room has a mini coffee bar with a coffee maker and all the fixin’s for coffee, tea, and a small refrigerator. Soda pop and baskets of goodies are also available in the main lodge for snacking. Linens and towels are furnished for all rooms including bathrobes and flip-flops. Laundry service is included in our pricing - bring your dirty clothes up and the staff will wash / dry them for you. Turnaround time is usually eight hours or less. A hairdryer, shampoo, conditioner, lotion, and soap are provided. Wi-Fi is available in the rooms. The instructors of Colorado Cattle Company and Guest Ranch are professional cowboys. The wrangler ratio for the guest is about one to five, so you can count on a very personal experience. Rides are not nose to tail and you can expect a variety of rides and scenery during your stay. Colorado Cattle Company and Guest Ranch can have any rider “roping live steers from horseback” in one week if that is what you wish. Every guest has the opportunity to tell them what their personal wish is, and they then work on that to make sure that wish comes true. Let them fulfil your personal desires and have the vacation of a lifetime! Every Thursday through Saturday, after the day’s cattle work is done and before dinner, they offer an opportunity for guests to further their riding education by participating in ‘Cowboy School’ - lessons in things cowboys do for fun! Roping is always a popular activity. Colorado Cattle Company and Guest Ranch has several teaching aids they utilize to take guests from beginner right on up to tracking live cattle. They focus their lessons so that guests can learn the correct way to handle a rope and how to handle a rope from a horse. In addition to roping lessons, Cowboy School also includes team penning, team sorting, cutting, tag, cowboy handball, barrel racing, obstacle courses, and other fun games that teach cattle handling skills and allow you to improve your riding while you are having fun. The instructors are professional cowboys. They have years of knowledge and experience and can share that knowledge with you. Beyond a guest ranch experience, Colorado Cattle Company is committed to sharing the cowboy way, the cowboy’s knowledge, and helping you to live your dream. The Colorado Cattle Company Ranch Rodeo allows you to bring your skills to the next level! Partake in these optional rodeo events at no extra charge. Every day brings a new adventure and challenge with a new event to help you improve your riding skills. Branding as well as gathering, sorting and moving the pairs to summer pastures. Fences must be checked for broken or damaged areas. Short - one-day cattle drives are weekly events until all cattle are settled for the summer. Spring activities can be hard to schedule; weather, sickness, calving, and feeding all play a part in the daily work. Moving cattle, gathering bulls, checking water, salt and fences, looking for strays and fence jumpers and driving them back where they belong. Remember, as a working ranch, cattle drives occur most weeks, all season long. Gathering and sorting, vaccinating and weaning the calves, short half or one-day cattle drives occur several times a week as you ship cattle to winter feed yards, etc. The work never ends! You catch, feed, groom and saddle horses. You can do as much or as little as you wish. You can join Colorado Cattle Company and Guest Ranch for the entire time or choose to relax part of the time. It is your choice. You gather and groom / saddle horses at 07:00. Served between 08:30 and 09:00 unless you are doing a big gather or cattle drive when it will be much earlier and on the run. The guests and cowboys go out to work cattle. 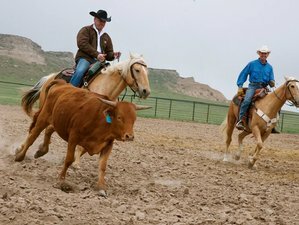 Colorado Cattle Company and Guest Ranch has cattle work out on the range every morning for guests who want to participate in the real thing. The Cattle Work ride leaves the corral as soon as you can get mounted after breakfast and returns around 13:00 unless the work takes you too far from the ranch to return for lunch. Served at the homestead unless Colorado Cattle Company and Guest Ranch is out on the trail driving cattle or helping a neighbor when it is sandwiches, chips, fruit, and dessert on the trail. Lunch is served between 13:00 and 14:00. Cowboy School meets out by the hitching racks or by the roping dummies and ends around 16:00. It includes roping lessons, team penning, cattle handling, cutting instruction, and horsemanship. Some days the morning cattle work continues into the afternoon, in fact, some days the ‘Cowboy Crew’ doesn’t even arrive back at the ranch until dinner time, so be warned that if you choose to do cattle work, reality sometimes dictates a long day! Happy hour starts after the horses are fed and settled for the night at 16:00 on the patio and dinner is served shortly afterward. Colorado Cattle Company and Guest Ranch has a liquor license and a fully stocked bar. The cattle work schedule is written on the board nightly so you know what is planned the next day. Note: There is no riding on Sundays, as it is the staff’s day off. This vacation will take place in New Raymer, Weld County, Colorado, USA. Meals are included in the cost of your vacation. All teas, coffee, juices, etc. are complimentary. Make sure to bring your appetite because three home cooked meals are served each day and snacks are available as desired to keep you full and energized. Hungry cowboys can sit down and dig into a real ranch meal three times a day. Breakfast meal choices range from eggs, bacon, and sausage, cold and hot cereal, fruit, yogurt; occasionally biscuits and gravy or breakfast burritos are also served. Lunch is normally served in the dining room unless Colorado Cattle Company and Guest Ranch is out on the trail or at a neighbor’s for the day. Sandwiches and soups, fruit, bread, and salad are typical lunch meals. Lunch on the trail is a brown bag containing sandwiches, fruit, chips and a dessert. The evening meal is served in the dining room nightly. Margarita night is on Thursday evening where the ‘all you can drink’ Margaritas are on the house. Other evening meals may include BBQ ribs, chicken, beef or pork served with appropriate side dishes, bread, salad, and dessert. Vegetarian and other special diets are happily catered to with advance notice. Colorado Cattle Company and Guest Ranch is a working cattle ranch and working guest ranch. This vacation is available all year round. To enjoy the maximum experience of the six-night stay, Colorado Cattle Company and Guest Ranch highly recommends arriving on Monday and departing on Sunday morning. This will enable you to enjoy the steak dinner on Saturday night.